Learn how to create to-dos or projects by speaking to Siri (requires iOS 11 or later). This article is part of a series on using Siri with Things. If you are looking for more ways to use Siri, please check out this page. On your iPhone, go to Settings > Siri & Search and ensure that Press Home for Siri is enabled. Within Settings > Siri & Search, scroll down until you find Things. Make sure that Use with Siri is enabled. On your iPad, go to Settings > Siri & Search and ensure that Press Home for Siri is enabled. Siri on your Apple Watch is turned on when you've enabled it on your iPhone. SiriKit isn't available on the Mac, but you can use Siri to create Reminders, and import them into Things. In Things | remind me to | buy milk. You need to tell Siri which app you are targeting. You need to mention Things specifically, otherwise Siri will save your task to Apple's Reminders app. You have to tell Siri to "remind" you, or to "create a task" in Things. You have to tell Siri what you want to be reminded about. 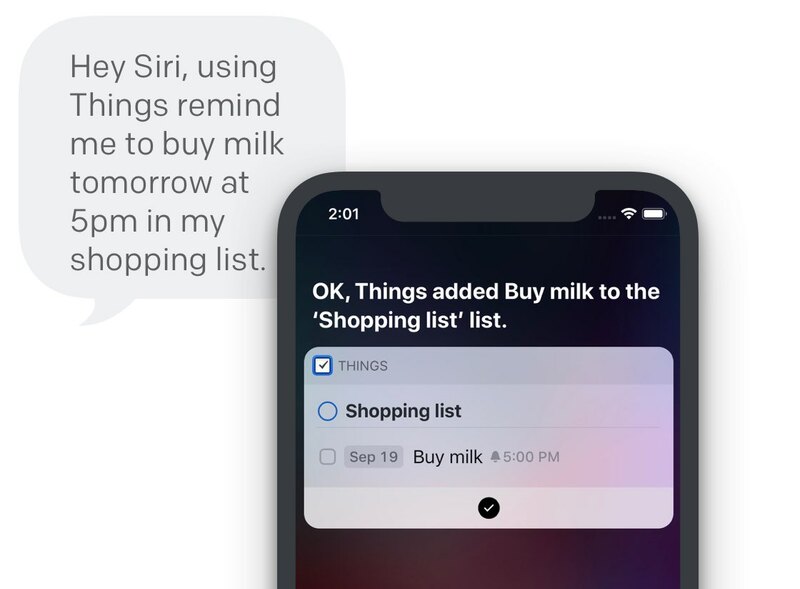 Siri doesn't understand the difference between a project or area, they are all considered lists: "In Things, remind me to Buy milk in my Shopping list." To see to-dos which share a specific tag, you have to ask for a list as well: "In Things, show my errands list." "In Things, remind me to buy milk." The to-do is added to the Inbox. "In Things, remind me to buy milk today." The to-do is added to the Today list. "In Things, remind me to buy milk tomorrow." The to-do is added to the Upcoming list. "In Things, remind me to buy milk tomorrow at 10am." The to-do is added to the Upcoming list and it has a Reminder which will notify you at 10am. "In Things, remind me to buy milk tomorrow at 10am in my Shopping list." The to-do is added to your Shopping project and it also has a reminder which will notify you at 10am the next day. "In Things, add a new list." Siri will now ask you to specify a name for the new list. "Add to my Shopping list in Things". Siri will ask you what the new to-dos should be. "Bread and butter and milk and cookies and juice". To ensure that separate to-dos are added, string them together with the word "and". "In Things, show my Inbox list." "In Things, show my Today list." "In Things, show all my lists." "In Things, show my tasks for next week." Starting with iOS 12, you can also record custom phrases called "shortcuts" to quickly create predefined to-dos or view lists. "...home improvement idea!" – Quick Entry in Things will open with a new to-do. The idea tag and Home Improvement project are already preset. "...school work!" – Things will open to your School area and the list will already be filtered by Homework. "...travel time!" – Siri will add a new to-do to your Today list that already contains the entire checklist that you have to run through before you go on a trip. Learn more about Siri shortcuts. You can't cancel or edit to-dos within the Siri screen. While we show the checkbox for every to-do, it’s currently not possible to tap this checkbox to complete the to-do within the Siri screen. These are not bugs. At this time, it's simply not possible for us to create these interactions within the Siri framework. Once this becomes possible, we'll certainly look into it. It’s not possible to target your projects or areas when creating to-dos via Siri on Apple Watch. You can only send to-dos to the Inbox, Today, Someday or, if you specified a date, to Upcoming. When using the Siri watch face to create new to-dos, you need to open Things on your watch in order for these to-dos to sync to your iPhone. After trying to speak a to-do to Things, you might see the warning that you should continue the interaction on your iPhone. Make sure that you have enabled Siri integration. To-dos might only appear with a delay on your iPhone. When you interact with Siri, you are not directly interacting with the main Things app. Due to spotty internet while you are driving, or if your phone operates on power reserve mode to preserve mobile data or battery, information created via Siri are not immediately sent to the main app. They will appear eventually. Unfortunately, we cannot teach Siri how our app name is pronounced. We hope that the more often "Things" is requested, the better it will become at learning it. Until then, you might have to experiment with different pronunciations. We found that in German, French, or Swedish, "Sings" or "Zings" yields good results. Starting with iOS 12, you can set up custom voice commands in your own language with Siri shortcuts, though. Learn more. "I wish I could, but Things hasn't set that up with me yet." When Siri gives you this message, followed by a button that prompts you to Open Things, you might still have Things 2 installed on your iPhone and iPad. Siri will default to the old app, which doesn't support the new Siri features. You need to remove Things 2 from your iPhone or iPad. If you keep seeing the above message, you might have to reboot the device to reset Siri, otherwise she'll keep trying to reach the app which is no longer installed. After a reboot, Siri will correctly target Things 3. On your iPhone or iPad, go to Settings > Siri & Search and scroll down until you see Things. Tap Things > Using Siri so it's no longer active. Invoke Siri by long-pressing the Home button. Say "Using Things, add a task." Siri will ask: "I’ll need to access your Things data to do that. Is that OK?" Confirm this with Yes. Then Siri should ask you "What should it say?" (the task you mentioned in step 6). Speak the title of your task, like "Buy groceries".